This post is the first in a series of articles covering GIT for Unity Developers. GIT is a great tool for any developer, but if you’re new to it, there are quite a few concepts to cover, and I’ve found most tutorials only cover a small part. This series will focus on what’s needed to make good use of GIT with as little complication and confusion as possible. While I know many developers love using the GIT CLI, I find it to be far from user friendly, and frankly a bit of a distraction for anyone who just wants to get work done. So we won’t cover that, but we will cover the features and concepts I find most teams using day to day. By the end of the series, you’ll be a Unity3D GIT pro! To follow along, you’ll need Unity and SourceTree installed. Any version of Unity should work fine, I’m doing this in 5.5. Unity – You should know what this is if you’re reading this. First, we’ll create a new project and name it “Git Branching”. If you’re wondering why the project is named “Git Branching”, it’s because we’ll be using this same project from the start, all the way through to branching, merging, and more. Edit the .gitignore file with your favorite text editor (I use Notepad++ for these things). Click on the Clone / New button. Select the Create New Repository tab. The git repository will be created and you should see this. If you see a bunch of files in the Library folder, your .gitignore file isn’t correct. Go back and double check that you have it named right and in the correct location. 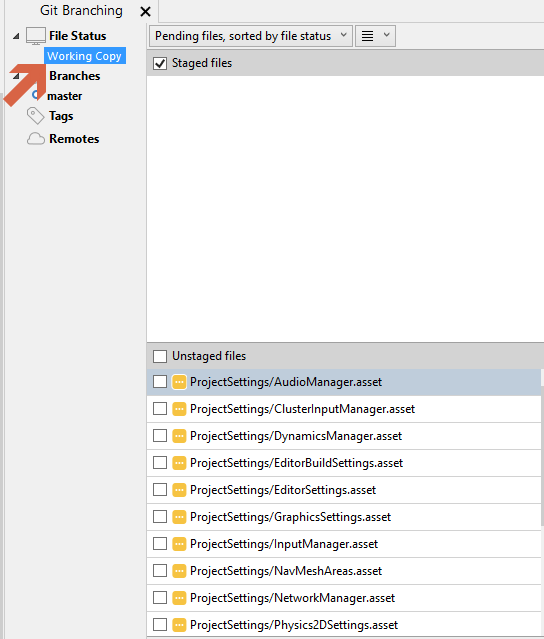 Click the “Unstaged Files” checkbox to move everything into the Staged files area. At the bottom of the screen you’ll see the Commit message area. Once the commit completes, switch from viewing the “Working Copy” to viewing the “master branch” by clicking on “master”. Here, you’ll see our first commit, with the commit message we entered. When you use GIT as a source control engine, it’s recommended to use the Text serialization mode in Unity. This is helpful when you need to merge later. 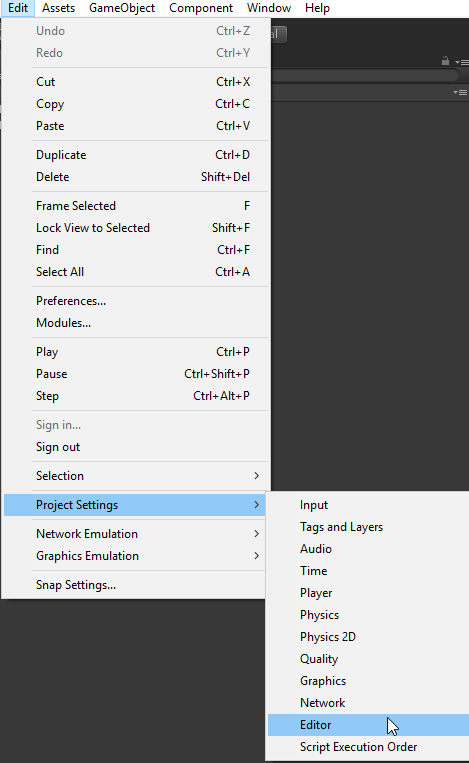 Open the Editor Settings page. 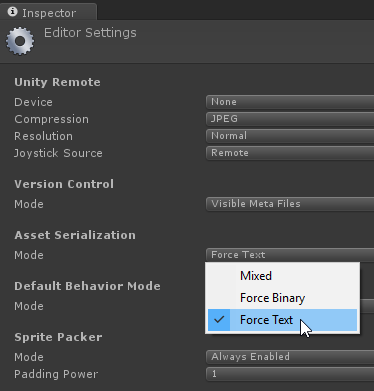 In the inspector, select “Force Text” for the serialization mode. Now go back to SourceTree. Switch back to the “Working Copy” view b y clicking on “Working Copy”. 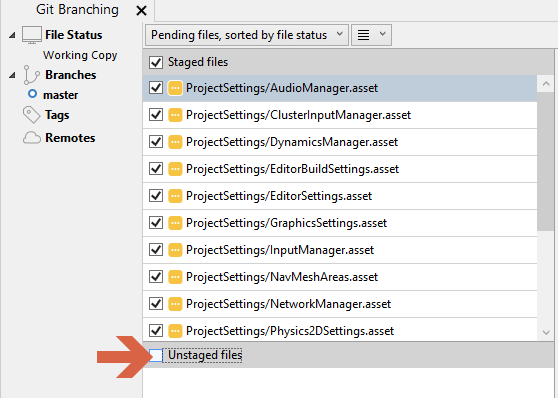 Stage all the changed files by clicking the “Unstaged files” checkbox. Enter a commit message that says “Changed asset serialization mode to force text”. The reason all of these .asset files are ‘changed’ and ready to be commited is that they were initially saved in a binary format. When we switched to ‘force text’ mode, they were re-saved as human readable text files. If you look at the “master” branch again, you should see two commits now. Okay, you’ve commited 2 things already, but haven’t done anything in the engine yet. Set the scale to (1, 2, 1) . Create a folder for prefabs. 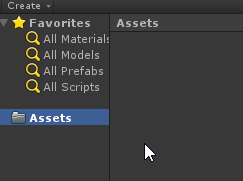 Drag the “TallBox” into the prefabs folder to make it into a prefab. Save your scene in a folder named “Scenes” and name it “TestScene”. In your “Working Copy” you should see 6 changed files. Select the 3 that are related to the TallBox prefab. You can batch select them and hit space or check them individually. 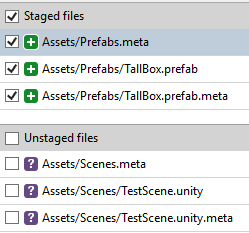 Your “Staged files” area should now contain the 3 TallBox related changes while your “Unstaged files” area still has the Scene changes. Type in the commit message “Created TallBox prefab”, then click commit. Why didn’t we do the other files? The reason we only commited the prefab and not the scene is to keep our changes logically grouped. Since the scene change isn’t directly related to the prefab it’s good to let it have it’s own commit. For this example it may seem like overkill, but as your project grows, you’ll want to be able to occasionally undo a commit. The less that’s in each commit, the easier it is to deal with them. There are of course limits, but a general rule of thumb is to group all of the files for a single change or feature into a commit. Select 3 the scene related files and commit them. Your master branch should now contain 4 commits. Before we move to more advanced things like branching, let’s cover what the checkout command does. 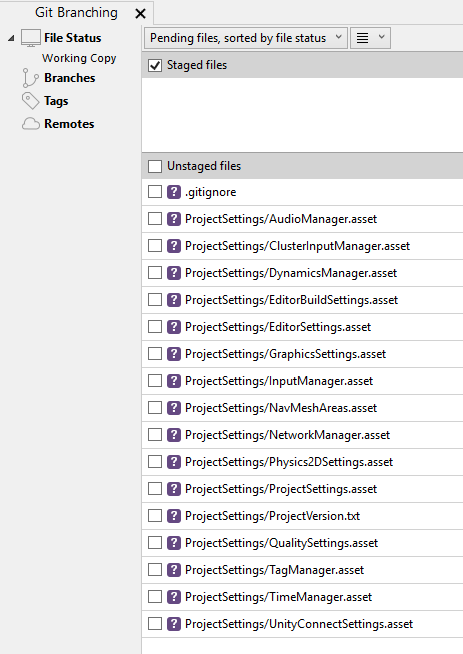 In the “master” branch, right click on the first commit “Project settings and .gitignore”, then select checkout. Commits are in order from newest to oldest. The first commit would be at the bottom of the list. You’ll be presented with a confirmation dialog that talks about your detached HEAD. Don’t worry about it, check the “Clean” box and hit OK.
Go back to Unity and you’ll see that everything is gone. That’s because we’ve checked out a commit from before the prefab was created or the scene was saved. Not worry though, our changes are in GIT. 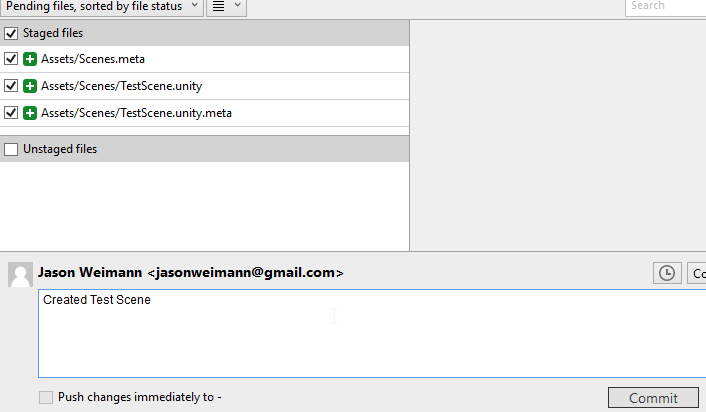 To get back to them, select the most recent commit “Created Test Scene”, right click, and Checkout. Go ahead and try this with the different commits and check Unity, you’ll see that you can get back to any state. With GIT, you have fast, clean, bookmarked history. And that’s just the start. Remember that how clean and how well bookmarked it is completely depends on you keeping your commits separated and well described.